If you see or hear the word Sfincione, I’m sure you’ll scratch your head and start digging into that little pocket dictionary. Don Tano here to solve your problem and you can leave the dictionary in your tote or whatever. One of the most common commodities you’re gonna find in Sicily is our famous street food. You might call sfincione a sort of pizza, but attention. Now I have to say that normally, the Sicilian people are quite open and outgoing. They’re known to have a great sense of humor, but there can always be exceptions. They take their food seriously and you don’t want to insult anybody. A sfincione is a Sicilian street food that is equally good for lunch or dinner. Many local inhabitants eat sfincione for a mid-morning snack. I hear lots of tourists say sfincione looks like a heavy brick and impossible to eat, but they’re making a big mistake there. I can promise you that it’s not like a brick at all. One slice contains only about 250 calories. Sfincione is something of very soft pizza dough. Usually, it has a topping of tomato, onion, and caciocavallo. Anchovies are sometimes added as well. Caciocavallo is a Sicilian cheese made from sheep or cow milk. Somewhere between bread and pizza, sfincione has a soft and spongy texture. The name derives from the Latin word spongia or sponge. Any outdoor market will have a number of food peddlers cruising about on three-wheel motor vehicles, (The Piaggio Apecar or Ape). Okay, I know they’re not the most sanitary-looking vendors, but I can assure you that no one has ever died after dining on a piece of sfincione. But a word of caution: After one slice, many have found themselves hopelessly addicted and when you leave Sicily, you’ll probably experience heart-rending withdrawal systems. 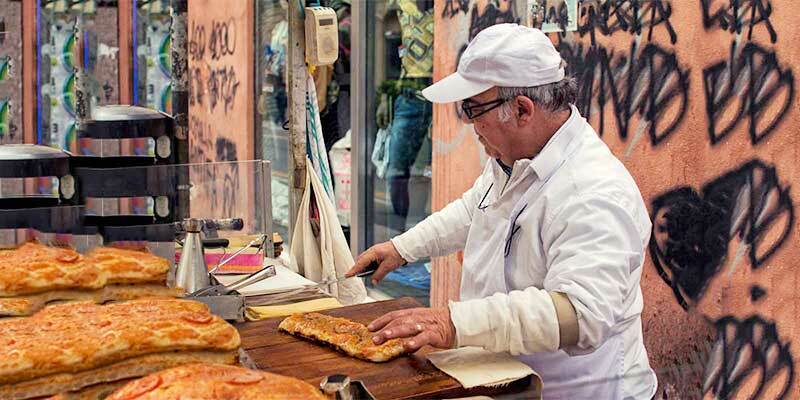 In addition to open markets, you’ll find sfincione in pizzerias, cafeterias, and bakeries. These are definitely cleaner but the taste is somewhat different. This is because they use a different recipe. As to preparation on the greasy Ape itself, I just don’t know. What I do know is that for the best, most authentic sfincione, go to the street vendors. I might get in trouble for giving out the recipe, but Don Tano Bongiorno, he’s not afraid of anything, well, except his lovely wife. If you want to try it at home, you’ll need flour, brewer’s yeast, onion, peeled tomatoes, fresh caciocavallo cheese, oregano, breadcrumbs, extra virgin olive oil, a little salt, and pepper, and if desired, anchovies too. 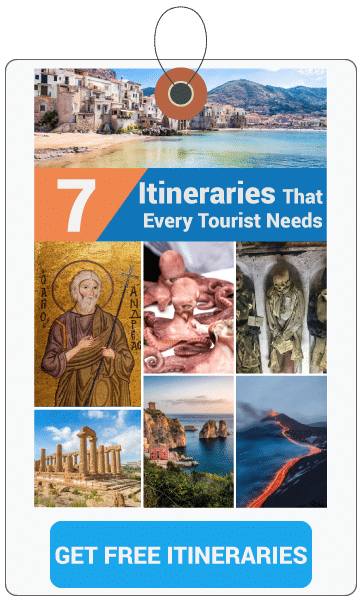 I hope you’ve learned a little more about dining in Sicily and the people who prepare and sell the delicious offerings, many of which you can find nowhere else. Hope this was helpful and if you have questions about Sicilian Cuisine just drop a comment to Don Tano in the comment box below.